If you are looking for a great assortment of tomato seeds to plant in your garden this spring, you’ll totally want to enter this awesome Botanical Interests seed packet giveaway. What Do You Win? The Botanical Interests Heirloom Tomato Seed Collection. It is a collection of heirloom tomatoes with wonderful old-fashioned flavor. 1. *REQUIRED ENTRY* What is your all time favorite tomato to grow in your garden? Leave a comment below letting me know your answer. This giveaway ends Sunday, February 14th, 2016 at 6pm PST and the winners will be announced Monday, February 15th. You will be notified via email and have 48 hours to claim your prize. Prize will be forfeited within 48 hours. I love growing Roma tomatoes! I make jars and jars of sauce for the winter! I like growing sweet 100’s in containers or in the garden! I love cherry red tomatoes! This is the first year that I am doing a full scale garden instead of just growing a couple of things in pots, so I’ll be doing all kinds of different tomatoes. I can’t wait! Roma’s have been my favorite the past couple of years! I love the black krims! Beefcake tomatoes are my favorite heirlooms to grow! I have three different variations to try out this year. I’d have to say that everyone in the family loves Sungold, we eat the right in the garden like M&Ms. Last year was my first year gardening and I did Roma and Sweet 100’s! I have always loved the Sweet 100 Cherry Tomatoes. Thanks for the fun giveaway- Botanical Interests is my favorite garden supply company! Happily following you on Pintrest. I love the Cherokee Purple tomatoes! Fantastic color and facinating history all in one! I love growing little cherry and grape style, perfect for kids and ducks. Super steaks!! Nothing like a two pound tomato. Oooh, we do love our tomatoes! Each year we grow about four or five varieties. I love Brandywine, but seriously they are all good! I love growing grape tomatoes (any type) as it’s so fun to just pick them and eat them right off the vine. The best one that thrives for me is any cherry tomato, but my favorite is Brandywine so tasty! Chrokee Purple are my favorite tomatoes to grow. Love the taste! Favorite has to be Cherokee Purple. My husband loves you he Green Zebra. Striped Roman or Black Prince. Both are beautiful, delicious, and grow well for me. I love paste tomatoes. I’m not great at growing them, but I love a good tomato sauce. I really love the Black Krim. I also enjoy growing any type of cherry or Roma tomato and love to can and freeze them for homemade soups and sauces. I also can lots of salsa! Mavis, I follow you on Pinterest and hope I win this heirloom tomato prize! I love Sun Gold & Sun Sugar cherry tomatoes. Growing them is my challenge! I have planted from seed and plants every year since 2007. Never have a good crop, but I don’t give up! Maybe this is my year! I liked & follow you on Facebook, Pinterest & Instagram. I already get your daily newsletter. I love any yellow, black or purple tomato – many of them don’t give a very large yield though. I love little yellow pear because it gives enough to eat bowls full every day. These grape tomatoes — can’t think of their name — kinda pinkish in hue and so sweet…they never make it inside…we just sit outside and eat them out of hand. I’ve also started growing a couple different heirlooms — don’t get as many tomatoes but they are tastier. I only grow about 4 tomato plants each year due to space. Nothing beats a fresh BLT. And the smell of fresh garden tomatoes…the best. Our favorite tomato is Juliet. It is tasty, prolific and a great keeper. At the end of our growing season we cut whatever is left on the vine and ripen them in the garage. We just finished the last of them the end of January! I follow you on feedly and never miss a post – does that count? We like early-girl. They are ready in less than 60 days! That’s when we buy them from the nursery. Anyway, would LOVE to try the seeds! Thanks! It’s a tools up. I will eat cherry tomatoes when I want to snack, but I love grape tomatoes in all salads. I could eat any type of tomato, at any time. From fried green tomatoes, to just plain tomatoes. My grandmother was the same way, and would eat them all the time, and she was allergic to them. Commented on the photo of yellow cherry tomatoes. Actually Cherokee Chocolate are my favourites, but the are so hard to come by, I would say Cherokee Purple. I like to grow Early Girl tomatoes. And cherry tomatoes, because you have a better chance in the Pacific Northwest of them getting ripe before crummy weather sets in. I subscribe to your daily newsletter…both of them actually! Beefsteak is my go to gal. Nothing can beat a slice on a juicy hamburger or bologna sandwich. Add some onions and mayonaisse and you cannot get any better. Sweet 100, without a doubt! San Marzanos are so great for sauces… almost no seeds! Roma tomatoes!! I follow your blog, pinterest, and facebook. 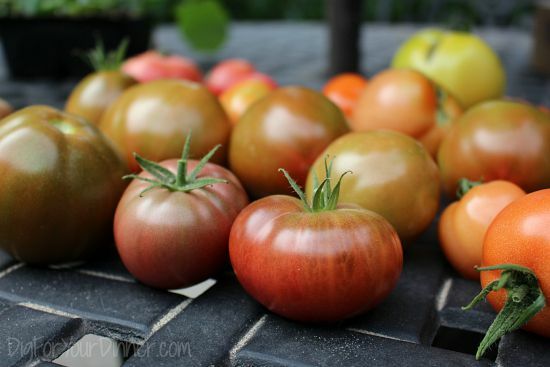 Black Krim is my absolute favorite–but I love them all!!!! Sun Gold cherry tomatoes for eating out of hand. San Marzano for sauce. Brandwine for slicing. My favorite tomatoes to grow are any sort of open pollenator cherry tomato. My toddler loves them fresh off the vine. As per usual I follow both sites on social media, am subscribed, and shared the giveaway on facebook. Cherokee Purples are my favorite tomato to grow. I’d love to try the San Mazzano! I follow you on FaceBook, Pinterest and Instagram. Sun gold cherry tomatoes. They are like nature’s candy! Plum for canning have been my favorite. I left a comment on the Meyer Lemon post on Facebook. Roma or cherry you get so may it makes you feel accomplished! I love growing sun gold tomatoes! I love growing san Marzano s.
I’ve never grown any tomatoes – excited to get started this year! Cherokee Purples look so inviting nestled among the green leaves. We grow different varieties. Like Brandywine, Yellow Pear, Etch! Romas are a favorite in our garden! Sun Gold cherry tomatoes! Love to eat them right off the vine! Truth: I just love tomatoes, but those are special. I commented on the “bulk bin” video! So funny! I’ve been a daily email subscriber for several years. Love, love the humor and I’ve learned so much, plus been inspired over so many things! Keep up the good work! I commented on the “bulk bin” video on your FB page. So funny! I still shop bulk, but I’m careful. Some times the situation just doesn’t look too sanitary. Then it’s a no! One of my favorites is Matt’s Wild Cherry…love the taste and the endless clusters of great little tomatoes these plants can put out. My favorite to grow is sun sweet cherry because i love to eat them right off the vine! I follow you on facebook- cause UR awesome! I subscribe 2 your daily newsletter! Park whoppers is my favorite!! I had so many 2 summers ago and it made the best tomato sauce ever. I love early girl tomatoes because they get ripe quicker! I follow on FB, Instagram, and Pinterest! I commented on the giveaway post on FB! Subscribed to your email newsletters! Botanical Interests pineapple tomatoes have been successful for the last two years at our house. My favorite to grow are red cherry tomatoes! My all time favorite tomato is Ananas Noire. First, it’s pink and green. Practically made for me! On top of that, they are huge and the most delicious tomato I have ever eaten. I’ve been growing them for about three or four years now. One slice is enough for a sandwich. The flavor though is just unbelievable. Mmmm! I follow you on all the socials. @preppycrocodile. I always plant at least one Early Girl! Pear tomatoes are fun to grow and make a great snack. My favorite heirloom tomatoes to grow are Brandywine. The comment I left on the giveaway on Facebook. I receive your daily newsletter. My favorite tomatoes to grow are roma. They are so beautiful and yummy! I share this on Facebook. I have liked you on Facebook and histogram and I shard this on instagram. Our newest favorite tomato is Brandy Boy with Cherokee Purple in a very close second. During tomato season we eat them for breakfast, lunch and dinner. Love ’em. I receive both of your newsletters. Always a good read. We love yellow pear tomatoes. I’m a daily email subscriber to both of your blogs. We love our beefsteak tomatoes for making lovely BLT’s, the best sandwich invented, EVER! I get carried away with my tomato plants but one all time favorite is Amish Paste tomatoes! Followed you on Facebook, Instagram and Pinterest, don’t want to miss anything! Left a comment on your Facebook page! I love growing park tomatoes because my son is named Parker! Plus they grow well here in the heat. I follow on instagram. And pinterest. I like the big boys since we have a short growing season. I had very good luck with Brandywines last year- very prolific and such good flavor. They definitely will be in my garden again this year! Romas are my fave for sauce. (I really want to try San Marzano for sauce though. I’ve heard great things) Any kind of Beefsteak is my favorite for just eating though. I love cherry tomatoes! I also follow you on facebook and pinterest. Brandy wine tomatoes are our favorite to grow in containers. 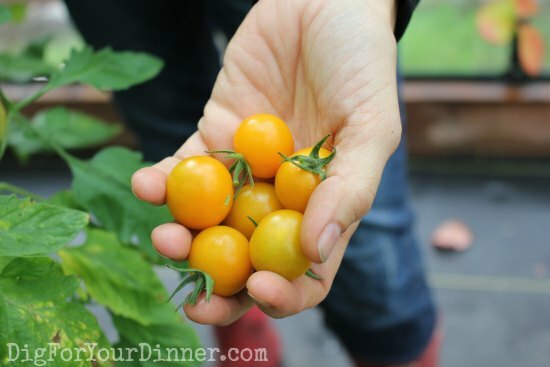 I love growing cherry tomatoes – I don’t remember the varieties I’ve tried from year to year. I just ask the guy at the farmer’s market which one is sweetest, and that’s the one I get. Yum! I’m subscribed to your daily email, which I always look forward to reading! Love all cherry tomatoes just eat right off the vine. I love growing cherry tomatoes but am looking forward to growing a variety of white tomato this year! I follow you on One Hundred Dollar and Dig for Your Dinner. I’ve only grown plum tomatoes. Isn’t that sad? This year will be my 2nd vegetable garden ever and I’m so excited to try many more varieties of tomato. Beefsteak are my fav, I follow you on FB, and I’m already subscribed. Cherry tomatoes….home grown taste just like candy! My favorite are probably the Cherokee Purple. It’s a real struggle for me to get any full-size tomatoes to grow where I am, but I’m really hoping that this year I will manage… I’m ordering a few cherry tomatoes (which do great here, actually) just in case, but I love the large slices of many heirloom tomatoes! I RSS your daily messages via Feedly. I follow Dig for your Dinner on Facebook. We are organic non-gmo disabled gardeners. This year will be our first using a hoop house, we love our Italian sauces from fresh Romas, to spicy salsa! We are delighted to have found your company. Thank you! Roma’s!! ALWAYS Roma tomatoes. Great for all things Italian! I like Roma’s the most as they hold up well for canning in sauces, paste or just plain old diced. I posted on FB and shared the post on my own FB site. I love growing the Rainbow Heirloom mix tomatoes but the down side with them is that you have to use them almost immediately. Last year I grew San Marzettoi (I think that is how you spell it! ), and these are a Roma style. MUCH longer life, but totally different tomato. This year, I may grow several different types. Not sure yet! Cherokee Purple Tomatoes, oh I love them! Yellow for DH for the lower acid to help with his heartburn issues. Grape for the kiddos, never make it inside they just eat of the vines! I love growing Roma tomatoes for sauce and roasting! I subscribe to your daily newletter for both blogs now! I commented on the Feta pot pie recipe! My all time favorite is still Brandywine. I just love the flavor and size and meatiness. I have never grown tomatoes, however, I remember eating them from my grandparents garden. They are so good home grown. I am doing my first garden this year and this would come in handy. I liked your post and picture on facebook for late January digs! My favorite is a Beefsteak Tomato one nice big slice between 2 slices of bread yum!! I follow you on all social media I love your blogs too! Any kind of red cherry tomato is my favorite. I love to dry them to use later in pastas, frittatas, or in homemade seasonings. Right now, though, I’m craving a salad with fresh cherry tomatoes. I commented on the quiche photo on Facebook. Last year I tried some new (to me) varieties, and the Green Zebra were my favorite, such great flavor! Black Krims are easily my favorite tomatoes to grow every year! Black Krim is my favorite. It’s meaty and earthy sweet. Love it! Dad always grew Big Boy so I do too. Yellow Pear are my fav, I could snack on those for hours! I follow you on social media! I commented on your lemon tree post. I was introduce to Mortgage Lifter tomatoes a few years ago and that’s all I’ve grown since! Love the taste. I also love Mortgage Lifter!! Early girl has always been a good one for the Portland Or areas. Fast start and good for short seasons. I’ve started by seed my tomatoes for over 26 years !! The only way to grow them! I start my tomato seeds the first of March. I always have large good sized plants by early to mid May when I harden them off and plant them in the garden. I follow you on face book and left a comment on the Spring is coming comment. I get both of your news letters and follow you on Pintrest ! Thank you so much for all your great information you always have on your sites !! Purple Cherokee because they are divine, and Roma because they are so darn useful. Thanks! I wish I knew the answer to this question. For the past 2 years I’ve tried to grow tomatoes, and have failed. But I think I finally have figured out all the problems and am especially looking forward to the pineapple tomatoes I started inside! I follow you on social media. Mortgage Lifter…I just get inspired by the name alone! It’s a tie between Sun Gold & Black Cherry. Each is sweet and addictively delicious! I hope to win. I like the San Marzano tomato the best. I love making my own tomato sauce and it tastes great! Sun gold cherry tomato hands down the best! A new favorite is Oregon Spring. I grew it for the first time last year. Granted we had awesome tomato weather last year, even so that plant put out an amazing number of very yummy tomatoes. A winner! I subscribe to both of your email newsletters. We love the small yellow cherry tomatoes the best. I love sweet 100s. They are wonderful! We love a variety called “Chocolate Stripes”… delicious, but not prolific. I love growing Maglia Rosa tomatoes because they’re so pretty. we love all varieties that we have grown, but i would go crazy if i could grow san marzanos! how amazing! My favorite is yellow cherry tomatoes, fresh off the vines. On the other hand my husband’s favorite is the beefcake ones. I like the yellow cherry tomatoes. I already follow your newletter. Love it. We love to grow Juliette tomatoes here in NW Florida. I receive your daily newsletter and look forward to reading about you and your garden. We really like growing yellow pear tomatoes. They yield so many and are delicious. I love to grow pear tomatoes. 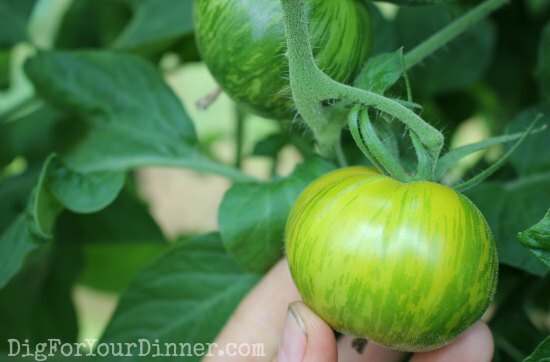 i love green zebra…did you know green tomatoes contain a substance that prevents muscle wasting in those over 60? green tomatoes and apple peels contain it. lack of muscle contributes to falls, which are bad news. i am growing zatlava this year…it has pink insides and a yellow outside. shared the giveaway on my facebook timeline. i left a comment on your facebook dig for your dinner post with all the tomato seed packets. We grow grape, roma, and beefsteak tomatoes in our family. I love Big Boy. There is nothing better than a big, fat, thick , juicy tomato on a salmon/hamburger. They are also great on BLT’s or just sliced with balsamic vinegar, evoo and italian seasoning. I liked you on facebook and left you a message on dig for your dinner. My favorite is the Cherokee purple with the yellow pear as a close second. I love cherry tomatoes, because my kids love to eat them straight off the vine! I subscribe to your newsletter and love it – thank you! My favorite tomato is the Supersweet 100. They are great for snacking on straight off the plant while I’m working in the garden. Started following on Pinterest, shared the contest on Instagram and am signing up for newsletter now. I have enjoyed onhundreddollarsamonth for quite a while – don’t know how I missed your new blog. Excited to see what all you have in store for us! I like the Cherokee Purple.